Exchange 2010 offers an additional feature that can allow moderation of emails sent to a particular DL. This would be a useful feature to most of the managed DLs which are critical and emails sent to them should be authentic and scrutinized before they hit the DL member mailboxes. Let’s take a look at the configuration of this feature. 1. Open EMC and locate the DL to be set for moderation settings. Right click on the DL you wish to be moderated for email messages sent to it and click Properties. A dialog box pops up, then select Mail Flow Settings Tab on the properties dialog box. Select Message Moderation option. First, you can assign a moderator to review all emails and then approve them to be delivered to DL members and then some exceptional senders who wont require an approval from moderator of the DL. One thing common between both these options is only a user having exchange mailbox can be added to these lists. and then, the last section is to specify the moderations notifications. If you want to let email senders know the status of their sent emails whether they were approved or declined you can configure it using “Notify all senders when their messages aren’t approved”. 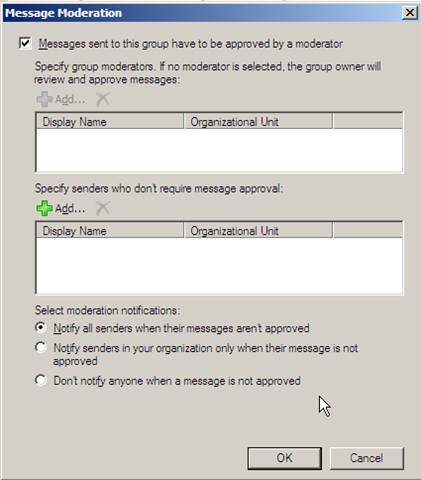 If you want the senders to know about the status only when the message was not approved then you can select the option to “Notify senders in your organization only when their message is not approved” and the last option can be chosen so that nobody gets an approval or denial notifications. 3. Once this is configured you can test it by sending an email to this DL. In my case I had the administrator as a moderator to the DL named “All Users” (The name of moderator isn’t visible on the dialog box above). 4. The moderator of this DL gets an email asking the approval. The moderator can preview the original message in the preview pane of OWA. 6. Now depending upon the settings you have chosen in step 2 the approval or rejection notices will be sent to original sender of the message. 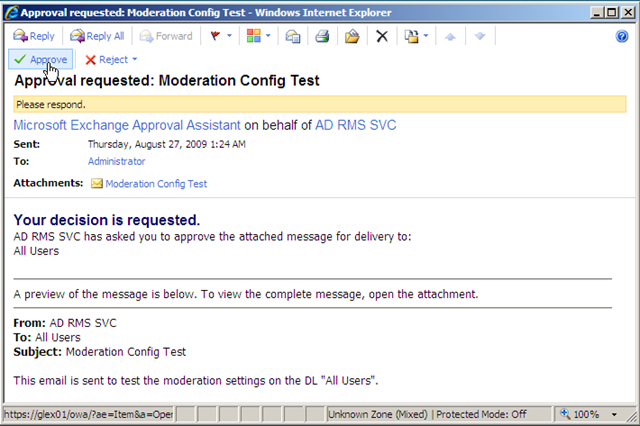 Here is something that you would like to know before you consider configuring message moderation for distribution lists, if you have your exchange 2010 servers installed in a mixed mode environment then message moderation may not work correctly sometimes. This may be because of the DL’s expansion server. 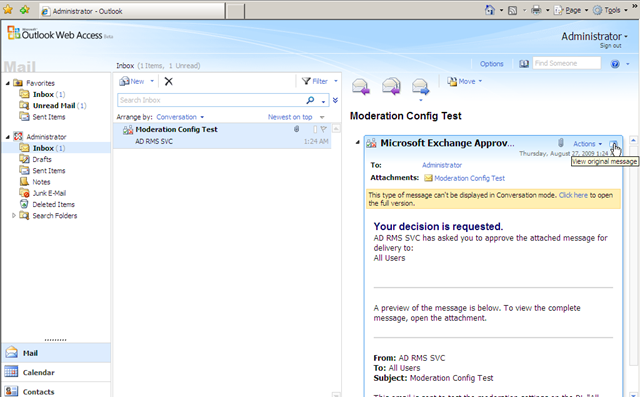 Exchange 2010 Transport is also rewritten with many new components in it and message moderation is one of them. Exchange 2007 and 2003 transport wont understand this configuration as this is an Exchange 2010 specific feature. So, if you want to use this feature for any DLs in your organization you must set your Exchange 2010 server as an expansion server for the DL or all of them. This entry was posted on 28/08/2009 at 12:15 PM	and is filed under Exchange 2010, MBX, Transport. You can follow any responses to this entry through the RSS 2.0 feed. Both comments and pings are currently closed.